The long-awaited release of the Beach Boys' lost '60s masterpiece Smile has introduced a new generation of listeners to the remarkable work of Van Dyke Parks, while reminding longtime admirers of his singular genius. As Smile's principal lyricist, the multi-talented Parks exercised considerable influence over that project's audacious, expansive vision. He would continue to maintain that level of artistic ambition and creative inspiration in his subsequent solo works. 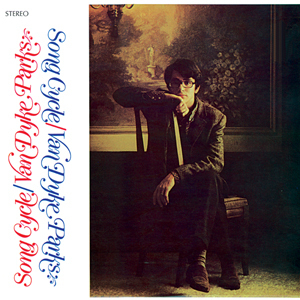 Although Smile would go unreleased for more than four decades, it did play a crucial role in launching Van Dyke Parks' long-running, consistently adventurous solo career. With a deal from Warner Bros. Records that allowed him a degree of creative control that was unheard of for a commercially unproven new artist, the young composer/arranger/producer/multi-instrumentalist—whose '60s resume also included recordings with the Byrds, Paul Revere and the Raiders, Tim Buckley, Judy Collins and Sonny and Cher—made a decidedly auspicious solo debut with his landmark 1968 release Song Cycle. A one-of-a-kind work that embraces nothing less than the entire history of American popular music, Song Cycle finds Parks creating deeply personal music by incorporating elements from a stunningly diverse array of styles including the pop genius of Phil Spector, Stephen Sondheim’s Broadway vertigo and the orchestral flare of American composer Charles Ives, and infusing this eclectic mix with a freewheeling, iconoclastic attitude that meshes well with the psychedelic spirit of the time. In addition to such vivid Parks originals as "Palm Desert," "Widow's Walk,” “The All Golden" and "By the People," Song Cycle features Parks' idiosyncratic readings of Randy Newman's "Vine Street" and Donovan's "Donovan's Colours." Simultaneously looking backward and forward, Song Cycle—reportedly one of the most expensive albums ever made at the time of its release—was wholly unique in 1968, and its singular musical vision remains unmatched. Our definitive LP edition of this classic is sourced from the original stereo master tapes, and includes the original album artwork!